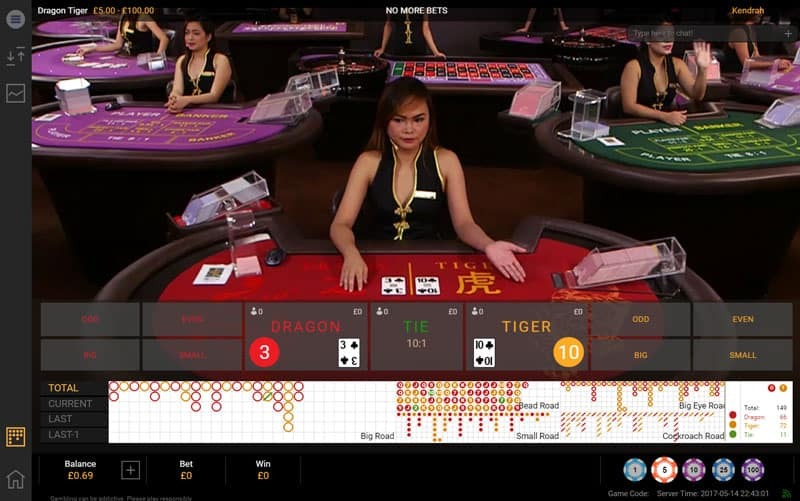 Playtech launches Live Dragon Tiger from their studios in Manilla, the Philippines. I’m somewhat surprised that it’s taken them this long, as the game sits nicely alongside Baccarat and it’s variants and is popular with Asian players. 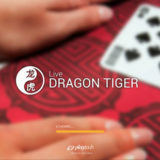 Dragon Tiger is probably the simplest table game you’ll ever come across. If you’re familiar with Casino Wars or War Of Bets games then you’ll understand Dragon Tiger in a heartbeat. 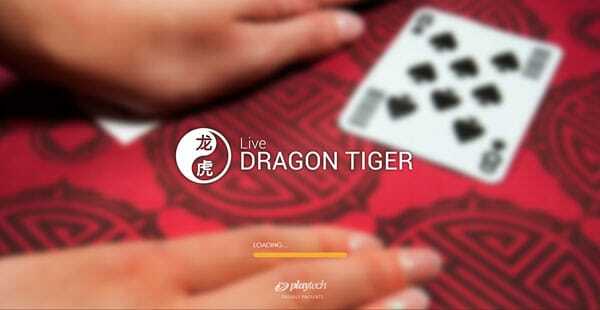 The game can be found by selecting the Dragon Tiger tab in the playing interface. At the moment the game is available at Bet365, so if you’re interested in having a look click on the button below. The game is very straightforward to play. You’re betting on one of three outcomes. A Dragon win and Tiger win or a Tie. One card is dealt to the Dragon and Tiger Positions. The card values are then revealed by the dealer. The highest card wins. The game is played with 8 decks of 52 playing cards. The dealing shoe is changed when approximately half of it has been dealt. You can place bets one of three outcomes. Dragon Win, Tiger Win or a Tie. In some configurations of the game, it’s possible to place multiple bets. You’ll see this option appear if it’s available once you have confirmed your initial bet. If you’ve bet on either of the two positions and both cards turn out to be the same value you’ll get 50% of your bet back. There is a range of additional side bets that can be played alongside the main hand. As long as you’ve made the main hand bet you’ll be able to play the side bet for Dragon and Tiger. Odd – You’re betting that the card will be an Ace, 3, 5, 9, J or K.
Even – You’re betting that the card will be a 2, 4, 6, 8, 10 or Q. Big – You’re betting that the card will be an 8 or higher. Small – You’re betting that the card will be 6 or lower. Note: the number 7 is excluded from the range of side bets you can make. If a 7 is dealt all side bets lose. There’s a range of roadmaps displayed on the playing interface to help you work out where to place your bets. As you probably know, the past history of a shoe does not have any bearing on what happens next, it’s completely random. But for those that like statistics the roadmaps are constructed from the Big Road, which is the map that shows the results of each hand deal from that shoe. The remaining roadmaps (Big Eye Road, Small Road, Cockroach Road and Bead Road) are derived from this one. You can read my article of how Baccarat Roadmaps are constructed if you’re interested in learning more.